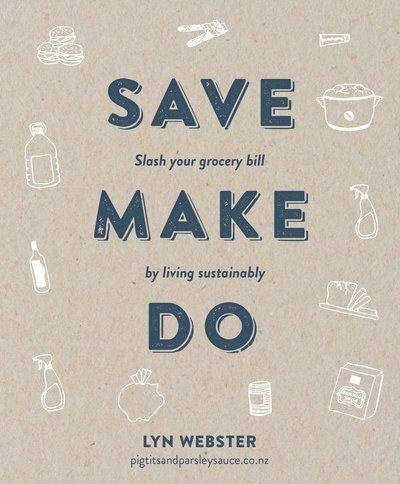 If you want to get ahead in life, both financially and sustainably, budgeting guru Lyn Webster can help. With a Save Make Do attitude, you’ll soon be on the road to financial freedom – by making simple, healthy and sustainable choices. Make a little go a LOT further. I went out flatting at age 18 and started buying my own groceries. I was 42 by the time I finally realised that I could have used baking soda for almost all my home cleaning and personal grooming needs. That was 24 years of spending literally thousands of dollars on toothpaste, shampoo, soap and plastic bottles containing various cleaning products for bathroom, kitchen, windows, floors, tiles – you name it, I probably bought the cleaning product for it. If only I had known I could take care of those needs with 25kg of bicarbonate of soda (baking soda) at $1 a kilo and some white vinegar at $1 a litre, while keeping my cash in my own pocket. Advertising has had a huge influence on my buying decisions. TV commercials encourage you to purchase everyday things to fix problems around the home, such as keeping the place looking and smelling clean; or to solve personal hygiene issues such as body odour, bad breath, and unattractive hair. The advertisers say they have the perfect solution for all of our problems, and they go to huge expense to deliver their message to us. Like lemmings we flock to the supermarket and buy, buy, buy all the products that we have been promised will make our lives easier. Love Save Make Do? Subscribe to Read More to find out about similar books.